2.4. 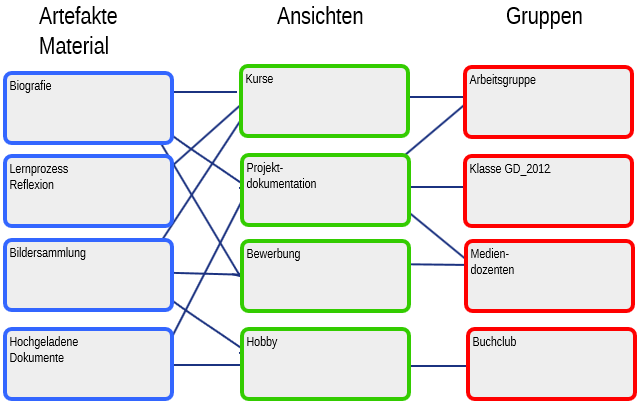 Wie passt Mahara in die Landschaft des eLearnings? 2.5. Und wenn ich eine Funktion benötige, die in Mahara nicht existiert? 2.6. Und wie geht es weiter? 2.7. Wo erhalte ich Ideen, wie ich Mahara nutzen kann? 2.10. Welche Version von Mahara habe ich? It often helps to use a metaphor to explain a new concept. There are many metaphors used for portfolios. Here are two of them to give you an idea of how you could explain portfolios to your learners. Kate Coleman explores the idea of using metaphors for portfolio work in her PhD thesis. Would you use any of these metaphors? Do you have your own? This metaphor is used by Mandia Mentis at Massey University in New Zealand. She shared her idea in the Mahara Newsletter January 2018. The basement is the common storage space of all the artefacts that the gallery owns or has leased. Artefacts are organized and catalogued to be found more easily later on when they are needed. A curator may shuffle artefacts around and add new ones as they come in. There is constant movement as artefacts are acquired, catalogued, brought up to the gallery for an exhibition, or returned to storage when a particular exhibition has finished. The different media are used as artefacts. They can be text, images, audio, video, sculptures, or a mix of them. The exhibition spaces can be small or large and are centred around a common theme each. The curator selected the artefacts to be shown carefully for the story that they want to tell. Not all artefacts that the gallery owns on a particular topic are exhibited so as not to overwhelm the viewer. Sometimes only one or two pieces represent a larger body of work. The curator provides insight into the collection by adding explanatory notes, meta information, and also interpretation to the artefacts for the viewer to be guided through the exhibit and made aware of the differences between the artefacts. Some of the exhibits are closed to the general public and require either an entrance fee or prior approval. In those cases, only authorized persons can enter the exhibit and view the artefacts. Viewers wander the gallery on their own or in groups and point out what they see or feel, discuss the artefacts and the wider collection, and engage with the curator or even the artists in discussions. They leave feedback or sign a visitor book to voice their opinion. They also overhear other people talking about the artefacts and learn from these interactions. Some of the exhibits are permanent while others are temporary allowing people to come back as often as they like or only during a specified time frame. At any time that they are in the exhibits, they can leave feedback, draw their own conclusions, and learn from the artefacts and the interpretations that they have seen. The gallery’s management team wants to keep everyone safe and also gather data which exhibits are the most popular, when people are coming to the gallery and how often, and what it costs to keep the gallery running. The team runs regular reports and makes changes to the gallery as a result of that. Basement: Mahara content area where you can upload files and create other learning evidence such as journal entries, plans, notes, etc. Artefacts: The pieces of learning evidence that illustrate a skill gained, a competency accomplished, a step made in a longer process or material referenced for learning purposes. Organizing and cataloguing: Putting files into folders and using tags on artefacts to retrieve them again later on. Exhibition spaces: Portfolio pages (small portfolios) or portfolio collections (large portfolios consisting of multiple pages). Insight into artefacts: Reflections and explanatory commentary. Entrance fee / prior approval: Assigning access permissions to portfolios based on who should be allowed to view the particular page or collection. Viewers: Portfolio Viewers; they can come on their own or in groups. Permanent / temporary: For how long the portfolio is available. Some portfolios may only be shared for a short amount of time with somebody else. Management team: The people running the site and offering the service. Feedback: Feedback left and comments made by viewers on someone’s portfolio, reflections or learning evidence. This metaphor was introduced by Hazel Owen on her website. She shared her idea in the Mahara Newsletter January 2018. An important aspect in this metaphor is the human element and that activities happen in communities and are not just things. In the performance metaphor we see that people interact in all matters from the preparation to the final performance and learn from each other. In the backstage area, projects are discussed and conceptualised, changed, and finalised. A team is often involved in these processes giving feedback, and inviting newcomers / apprentices to try things out and learn from more experienced staff. Depending on the director, a performance in one theatre may vary widely from that in another as a play can be interpreted many different ways, kept in its classic form, modernised or completely re-imagined. It is up to the company to settle on their interpretation and the way forward, which can include changes to the language, the mood, the back drops, and props used during the performance. The backstage is only accessible to a group of authorised staff. Outsiders need a pass to be invited into this space. Rehearsals play a fundamental role when preparing for a performance as they give the performer the time to practice their art, receive feedback from a teacher or also peers. They can practice in a safe space that is not accessible to an audience and thus don’t have to fear premature comments that would only be based on a small extract of the performance rather than its entirety. Once the performance is deemed to be ready to be shown, often a dress rehearsal is scheduled to invite a select group of people for feedback and giving the troupe a chance to make final adjustments before the show is taken live. Many different performances can take place within a building attracting different audiences, which in turn have different experiences that they bring to the events and see them through different eyes. Some performances may require an entrance fee whereas others can be free. Some may also invite people to participate more fully in the performance itself rather than only sit and watch. Backstage: Artefact upload and creation and portfolio setup space before the learning evidence is shared with a wider group; portfolios can be created by individuals or in groups collaboratively. Interpretations: Personalisation of each portfolio author in how they want to display their learning evidence, reflections, etc. Only the major version number of Mahara is displayed for security purposes. The minor version number is only visible to the administrator on Administration menu → Admin home. We recommend you keep Mahara up-to-date with security updates to ensure that your instance is not vulnerable to known security issues.